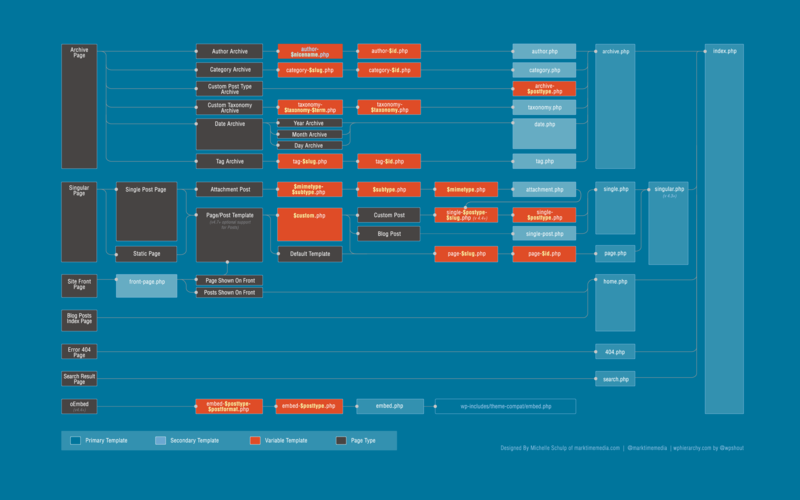 Template Hierarchy graphic has been updated to include all the new and removed templates since version 4.4, including oEmbeds and the new Post/Page Template workflow. And of course, hop on over to wphierarchy.com to see this graphic in action! As a person with a passion for infographics and simplifying the display of data, I am always looking for ways to make information more clear. The world is filled with an ever-increasing amount of data, but this data is only useful to us if it is usable. A well designed infographic makes even the most complex ideas understandable, but a poorly designed infographic can make simple ideas needlessly confusing. It is this exact usability issue that plagues most infographics today, even within a place I seem to be spending an ever-increasing amount of my time: the WordPress Codex. 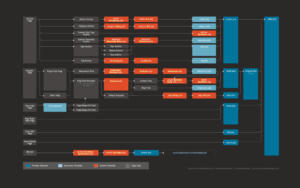 One of the most crucial pieces in understanding how to develop WordPress themes is the WordPress Template Hierarchy, the way that WordPress decides how to lay out the content based on what sort of content is being served. The Template Hierarchy, in combination with other cool functionality like Custom Post Types and Custom Taxonomies, is what really enables WordPress to have great granular content management, and create custom visual solutions for increasingly specific types of content. (for the non-geeks reading this: just trust me, it’s neat!) 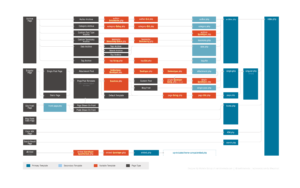 However, while the information compiled on the Template Hierarchy is great, the visualization of it can hinder its use due to its inability to be quickly scanned and understood. So, I decided to take it on as a personal project! This isn’t the first time the Template Hierarchy has been revisited. 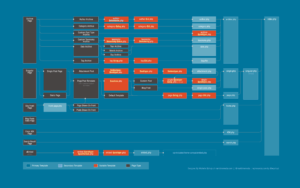 The great folks at WordCamp Minneapolis put together a whimsical Template Hierarchy poster for their attendees (I have one!) that makes a great addition to any WordPress professional’s bulletin board, but the design focuses more on fun than functionality, targeting an audience that already has a deeper understanding of how it works. Let me know what you think! Feel free to use it, pass it on, and leave some feedback! Awesome work Michelle! Love how you made it easier to understand. It’s always been a great tool in the WordPress codex, but obviously could use the work to make it more usable. Great post! Very useful. Is there a way to add a link to download a higher resolution version for reference? The type is really small. Hi Dan – You can right-click to get the full-sized image, but I’ll probably be putting together a PDF version also (when I have some time) that I’ll link to as well! So awesome to see someone taking a fresh, aesthetic approach to something that’s so very important (and still very confusing to many people)! Wow, finally something I can print and give to my team that actually looks GREAT! Nice job! Awesome stuff Michelle! But then, what else would we expect? Just a heads up , the infographic is not as accurate as the codex one because yours does not show the actual load order. The 404 page is first, then search, then tax, …etc, etc. I always wondered why it was laid out that way. Interesting! I wish! It was too close to other WordCamps; boss won’t pay for it. Such a great lineup! I figured this would be in the WordPress codex by now, but I was surprised to still see the old clunky one. Thanks for the great redesign though! You rock! I am using your infographic in my slide show Creating Great User Documentation for WordCamp Chicago. It is an excellent example of making info more clear. This is a great diagram! 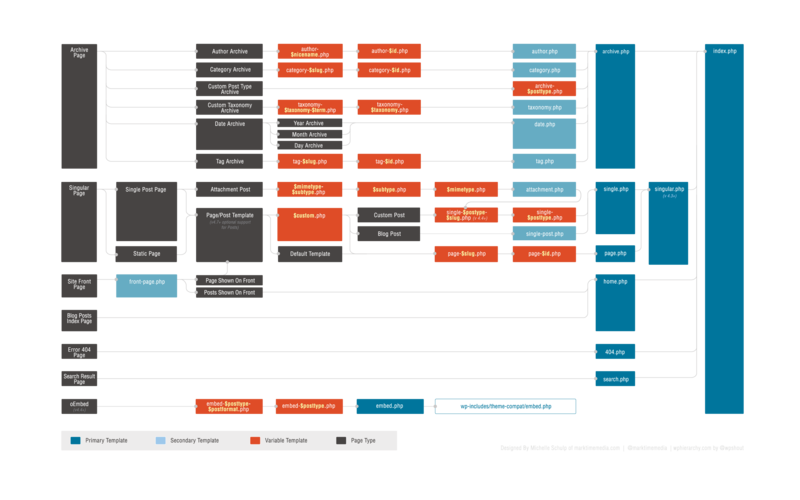 Love it because it takes less time to understand the concept with this diagram as compared to the codex version. But, the title “Redesigning the template hierarchy” is misleading as the template hierarchy remains unchanged. (Refer: http://stackoverflow.com/questions/12196986/changing-wordpress-template-hierarchy). 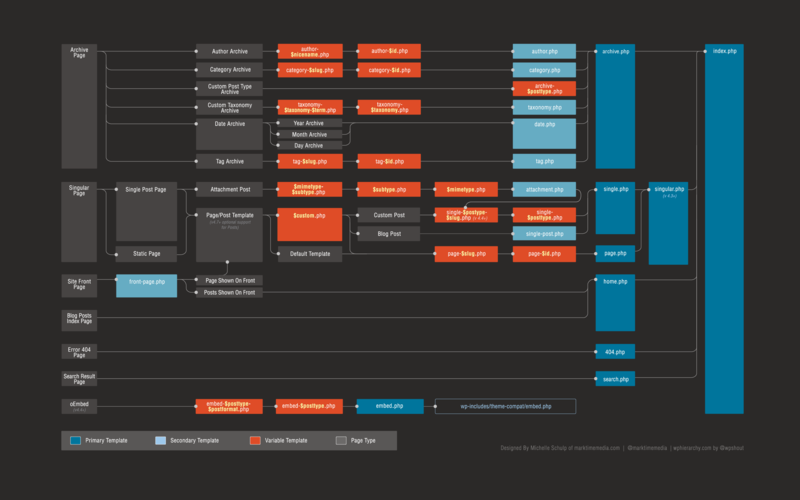 Something similar to “WP Template hierarchy illustrated in a readable format” would have been more precise! Really cool tool. Thanks Michelle! OMG, thanks a lot for this. I was creating pretty good static html sites but was having the roughest time trying to translate it over to wordpress. This post definitely saved me a lot of headaches. Almost 1 week of searching, thanks a lot for this post.